Last year, my husband saw me playing Saints Row the Third and promptly bought it on Steam for himself. At full price. I had to shake my head. Steam sales happen too often to ever justify paying full price on Steam for a video game. If a game on your wish list isn’t on sale, just whisper your desires to your preferred social media platform and by some sort of space magic, you’ll soon receive a polite email from Steam letting you know that your wish has been granted. And when Christmas and summer roll around, hand over your wallet and abandon all hope. Because there is no resisting the call of the mighty Steam Sale. Through my wisdom, my husband has come to understand the ways of Valve Corporation‘s internet-based digital distribution, digital rights management, multiplayer, and social networking platform. 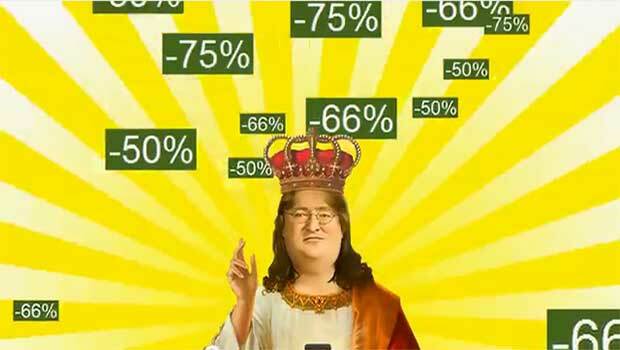 Managing Director, Gabe Newell‘s face now graces many of the memes depicting the power he holds over PC gamers and our wallets because of the steeply discounted prices Steam offers. Sales happen so often that one should never succumb to a purchase at full price. Patience isn’t exactly a virtue here, but at least you’ll save some money on games that you probably won’t play for a long time, but can’t resist owning at such great prices. We are now in the midst of the blessed Steam Summer Sale, June 19-30, but I’m here to tell you that it is possible to survive the Daily Deals, Flash Sales and other temptations! Sort of! I’m very proud of myself for going for four days without a single purchase! Not that my wish list is empty. It’s just that none of the games on my list have made it to my five dollar or less purchase rule, which I have almost totally adhered to. 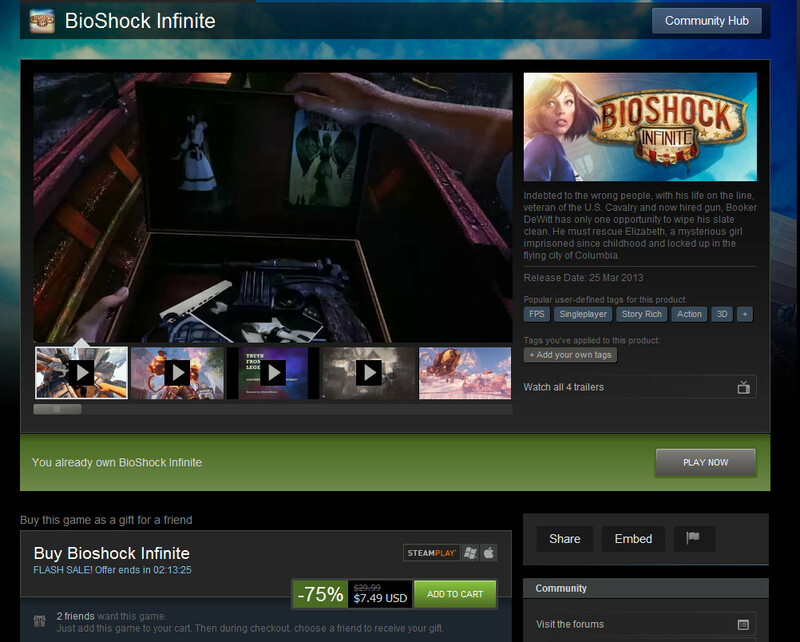 Well, okay I almost bought Bioshock Infinite yesterday for $7.49, but fortunately, Steam reminded me that I already owned it. And as I type this, pausing to check on the latest sales, my husband has taken one for the team by purchasing Borderlands 2 and Transformers: Fall of Cybertron on my behalf . Yes, it totally counts as me continuing to fight the power, even though I’d already added them to the cart when his message popped up. Like many other games purchased during these sales, all of them now sit pathetically on my Steam Wall of Shame, and won’t even be downloaded for some time. Because that’s just how we Steam users roll. I swear I’ll play them all. One day. My friend and I once joked that if gamers happened to see a Steam employee walking down the street, we’d automatically just hand them our wallets. They would smile beatifically and grant us the blessings we so eagerly desire and we’d continue on our way. Because you see, there is very little hope for us once the Steam sale is pounding at the gates of our resolve. The only thing we can do is try to shop wisely by following handy tips like these. And even if we do manage to resist handing over our money for a time, we’re still visiting the site three, four, five times a day, just to check if maaaybe there’s something we really should buy, or to vote on the community deals, or to collect shiny red balls. In recent years, Steam has introduced virtual trading cards that do nothing to advance our health and well being, much less our sanity, but damn if my friends and I aren’t out collecting them like kids on the playground. The trading cards are earned by voting on community sales and by making purchases. They can be traded and sold. Some people can make a tidy little profit (to spend on games, of course), but many of us are more interested in collecting enough to craft our virtual badges, which again, serve no greater purpose than to allow grown human beings to show off something shiny but absolutely useless in the grand scheme of life. Oh we know how pathetic we sound, but the badges are pretty darn cool, okay? Somewhere, Pavlov is shaking his head sadly. In this year’s “Summer Adventure,” Steam has really upped the game by adding a new angle: competition. Sign up for one of the five teams for your chance to win three games on your wish list! All you have to do to earn points for your team is …. buy stuff. Well played, Steam. Well played.